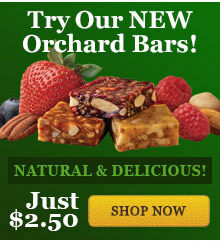 The perfect take-along treat! Our four-piece Samplets are just the right size to take along for lunch, office snacks, long drives, vacations, or party favors. 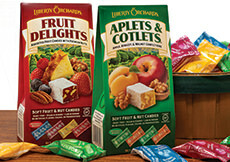 The sealed packets also offer a convenient way to enjoy just a little candy at home, at its freshest each time. Kosher. 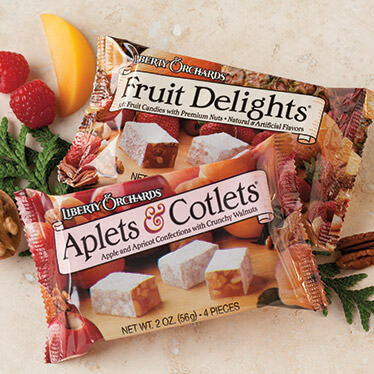 INGREDIENTS: Aplets & Cotlets: sugar, corn syrup, walnuts, modified corn starch, fruit juice from concentrate (apple & apricot), pectin (pectin, disodium diphosphate, sodium polyphosphate, dextrose, dicalcium phosphate), natural flavors, sodium citrate, citric acid, malic acid, soy lecithin. 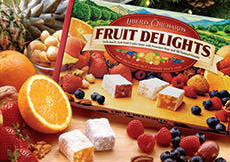 INGREDIENTS: Fruit Delights: sugar, corn syrup, nutmeats (walnuts, pecans, macadamias, cashews), modified corn starch, candied orange peel*, pectin (pectin, disodium diphosphate, sodium polyphosphate, dextrose, dicalcium phosphate), crushed pineapple, natural & artificial flavors, fruit juice from concentrates (strawberry, raspberry), pineapple juice, sodium citrate, citric acid, malic acid, soy lecithin. *Orange peel contains sulfur dioxide (a preservative). 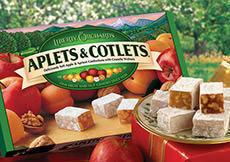 These are the Greatest, my Great Aunt would always bring us a couple boxes every time she visited or sent around Christmas Time.